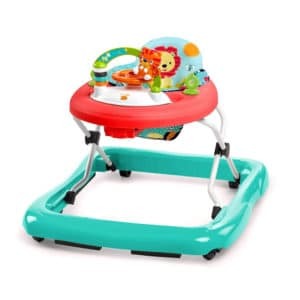 Top Baby Walker Reviews for 2019 - Which One is the Best? One of the pieces of baby equipment that parents have been buying for years are walkers, which lets young ones scoot around your home before they’ve learned to walk on their own. Over time, though, walkers have become a controversial subject because many pediatricians now advise against their use. Some view these as potentially dangerous because they can quickly build up speed that babies are unable to handle; others claim the equipment doesn’t do anything to help an infant, and can actually impede a child’s development by placing her pelvis in an unnatural position while seated. The majority of experts now recommend stationary baby activity stations and jumpers instead. Many who had their own walkers when they were infants (and grew up just fine), however, still favour them as a fun way for their older infants to learn mobility and coordination. The smart approach is to make it a carefully-controlled, parent-guided activity, which minimizes the danger of unexpected bumps and tumbles down staircases. If you fall into that category and are searching for the best baby walker, some of the new models are definitely safer and more desirable than others. We’ve put aside the overall discussion of safety and physical development to take a closer look at them, so our baby walker reviews simply focus on the pros and cons of each model. 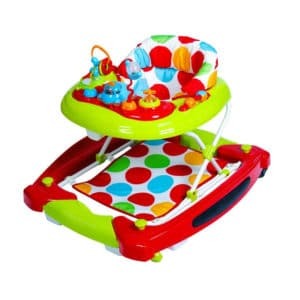 Ready to Buy the Best Baby Walker for Your Little One? a “walk-behind” model resembling a wagon with a protruding handle, which allows an infant or very young toddler to push the toy from behind, and then stop, sit and play with whatever is in front of him. The second is a “sit-inside” type which is more like an activity center on wheels or runners, and suitable for children starting around the age of six months. The description “sit-inside” is literally correct when describing models which do not allow babies to stand; they can just “scoot” along from their seat. Other sit-inside versions, though, are “sit-to-stand” and give the kid enough room to stand up and maneuver. Your baby’s well-being is the most important consideration when looking at walkers, and there are three basic factors: the wheels, the base, and safety strips. Some parents feel that models without any wheels at all are actually the safest, because they’re less likely to quickly and unexpectedly build up speed. Those with rubber feet (often called stationary walkers) or ExerSaucers are two alternatives to look at. 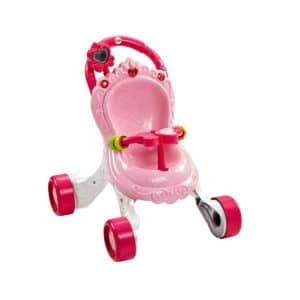 If you’re choosing a baby walker that does have wheels, you’re likely to find that most models have standard-sized wheels, so what you really want to look at whether the wheels can rotate. Some allow you to lock only two of the wheels, and others have two or four rotating wheels. Either setup can allow a baby to spin out of control without warning, and require extra-careful supervision. Another thing is it should have a wide base, for two reasons. The first is simple physics; a wider base lowers its center of gravity and lessens the chance of a tip-over. But it also prevents the baby from maneuvering through doorways or archways to get into other areas of your home which present even greater dangers, like the kitchen. The actual manufacturing quality of the product also matters, of course. These days, most sit-inside baby walkers come equipped with anti-skid, rubber friction strips on their undersides. The strips stop the it from moving if it encounters a ledge, steps or other drop in elevation. The number and size of strips may vary from model to model, but you should not purchase one without friction strips. In fact, in many areas and countries those without these strips is banned. Safety isn’t the only variable, naturally. The number of height settings can extend its usefulness as a child grows taller, and the amount and quality of the seat’s padding will have a direct effect on the baby’s comfort and the amount of time he wants to spend in riding. The fabric of the seat will also have a direct effect on mum, since some walkers will be much easier to clean after baby’s spilled something or had an accident. Finally, there’s the question of entertainment. You may think that you’re buying a baby walker with toys attached, but your baby is more likely to see it as a fun activity center that also moves. The majority of the new sit-inside models these days have a colourful combination of plush or plastic toys and an electronic console which feature noises, lights, music and other tactile and audio/visual stimulation. There may also be room for snacking. Some parents also look at the portability when looking at walkers. There are those who prefer models that are foldable, compact, and lightweight so they can easily carry it with them when they travel. We’ve chosen the ultimate baby walkers for review, and here’s what we’ve found to be the high (and if necessary, low) points of each. this walker will intrigue your older infant or young toddler so much that she may not even bother trying to push it. The activity centre on the First Steps detaches, so it can be played as a separate educational panel; it has a small musical keyboard and plays songs, and it has a swinging door, moving knobs, gears and rollers, a play phone and other tactile goodies with letters, numbers, colours and barnyard animals to fully entertain your young one. 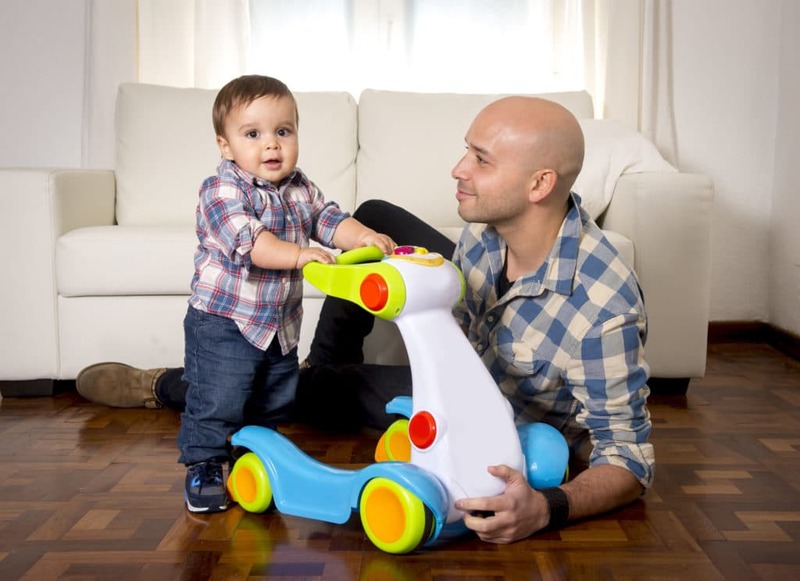 It is made from sturdy plastic with medium-sized textured wheels – but no brakes, so be sure to monitor your little one’s first steps with the First Steps very carefully. small children love safari-themed toys; the bright African animal design of the sit-to-stand Bright Starts Walkabout is certain to delight any kid, with the removable electronic activity centre featuring a steering wheel, lights, sounds and a few songs. The wide plastic frame with a high-backed seat and the cushy seat pad are strong and easy to clean, respectively, and provide good support. There are three height adjustments. The wheels are on the small side but swivel freely without brakes; rubber feet help slow the Walkabout down when approaching uneven surfaces but parental supervision is again a must. This Bright Starts model also folds for storage. this plastic baby walker. But the chances are just as good that he’ll be happy sitting in it and playing, because the My Child Coupe is built to do double duty as a rocker, complete with a supportive foot pad. When set to be used as a walker, this model has speed-restricted front wheels that swivel and rear wheels that don’t, so supervision is once again important despite the rubber pads. 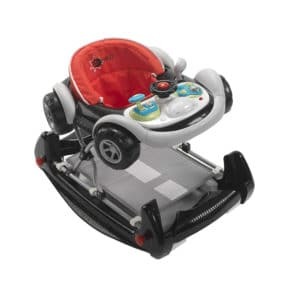 The padded seat is height-adjustable, the removable play tray has a small steering wheel, gear lever and horn plus some spinners, lights and sounds, and it’s easy to clean and fold up. 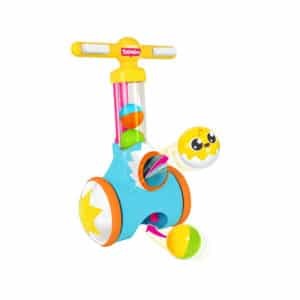 Go Round is slightly sparse compared to other models, with a few twirlies, lollipop and cupcake toys which will be more likely to entertain younger infants than older ones. As a sit-to-stand model, however, it does the job with good support and padding, and ample room for 6+ month olds to manoeuvre. The wheels all swivel and there are no brakes, so the usual precautions apply; there are three height adjustments. The one big drawback is that the seat insert can’t be removed for washing. this model. It’s built as a doll stroller (the doll is not included with your purchase so it isn’t free) that your baby can take for a stroll as she supports herself with the wide handle. 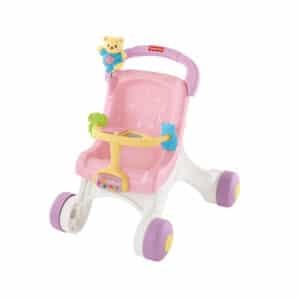 Music plays as it moves (or when the button on the attached teddy bear’s belly is pushed), and the wide base with large extended plastic wheels guarantee stability. There’s a small activity station where the doll sits, so baby and her baby can play with spinners, rollers or a flip book when not walking. A brilliant combination of role playing, first steps and fun – and our choice for walk-behind best baby walker in the UK or anywhere else on the continent. memories will come flooding back the first time you see this bright red, yellow, green and blue polka dot sit-inside model. 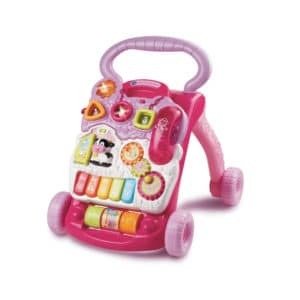 This model has a rocker mode (with foot pad) as well as a walker mode, and there is a much more robust electronic play station than on the Red Kite Twirl reviewed earlier, with entertaining toys that play music and move. As you’d guess from the “Twist” name, all of the wheels rotate so it can spin easily and requires parental…well, you know the caution by now. There are three height positions. My Stroll and Play we’ve already looked at, with a cute pink design that little girls will adore. Once again, it’s a walk-behind play stroller in which a (not-included) doll can sit while your baby pushes her along. There’s the same musical reward that plays as the stroller moves, with a heart-shaped wand that she can also bat to play music (rather than the teddy bear that’s on the larger model). Despite its plastic build, this is a sturdy and one of the most reliable walkers of this type. This is really a toy for toddlers and not suitable for infants just learning to walk; the recommended age for the Pic ‘n’ Pop is 18+ months. The explanation is simple: it’s designed to refine walking and motor skills, not to help a baby learn to walk. When the toddler pushes a button on the handlebars this toy (shaped like a toy lawnmower) launches a small ball from a chute inside the unit. It is then rolled over the ball in order to pick it back up again. It’s a fun toy for toddlers – just don’t plan to use it with your six-month old. This is extremely well-built from rubberwood. 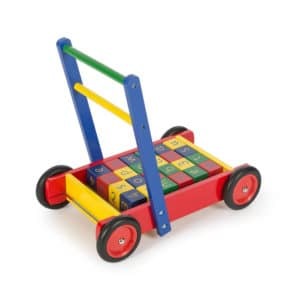 The bricks in the name of this product are really wooden alphabet blocks, which fill up the “wagon” and give infants an educational and fun break from learning to push it around your home. The large rubber wheels are cushioned to ensure that they grip well and move slowly; if you’re looking for old-fashioned quality, you’ve found it. 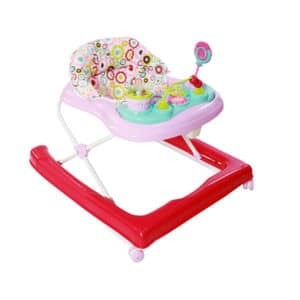 The Pintoy Baby Walker is also the only one of on the list which meets the European EN71 toy safety standards. As you’ve seen from our baby walker reviews, walk-behind models are quite different than sit-inside ones and the two must be judged very differently. We’ve included what we feel is a comprehensive assortment of the safest and most reliable ones on the market, but these are not the type of infant equipment you can leave baby alone in for a few moments so your hands are free while you refresh your coffee or tidy up your home. Continuous supervision is crucial; your baby has to always be within your view because even the best baby walker is only as good as the parent or caregiver standing or sitting alongside. Many mums have found that their infants prefer to use theirs simply as a play station, showing almost no interest in actually walking – and pediatricians assure us that’s completely normal. They will do so when when they’re ready, whether or not he has a walker to help. In the meantime, the details we’ve supplied on the toys and activities available with each model will help you ensure that you end up with one your baby will love, even if he’s just sitting and playing with it. It is very tough to choose the right baby walker for the baby. Special Thanks to bestspy for this suggestions. Hi Linda. You are quite welcome! Feel free to browse our baby category for more useful tips and suggestions.